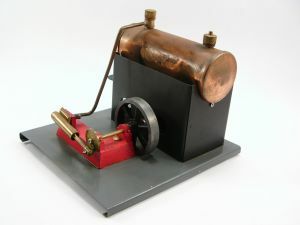 A Steam Engine is a heat engine that performs mechanical work using steam as its working fluid.The first practical steam-powered ‘engine’ was a water pump, developed in 1698 by Thomas Savery. It used a vacuum to raise water from below, then used steam pressure to raise it higher. Small engines were effective though larger models were problematic. 1. When we boil water it produces high pressure steam. 2. This high pressure steam is used to push the piston or turbine forward and become low pressure steam again. 3. This low pressured steam is condensed back into water and cycle continues. How to make a toy Steam engine?